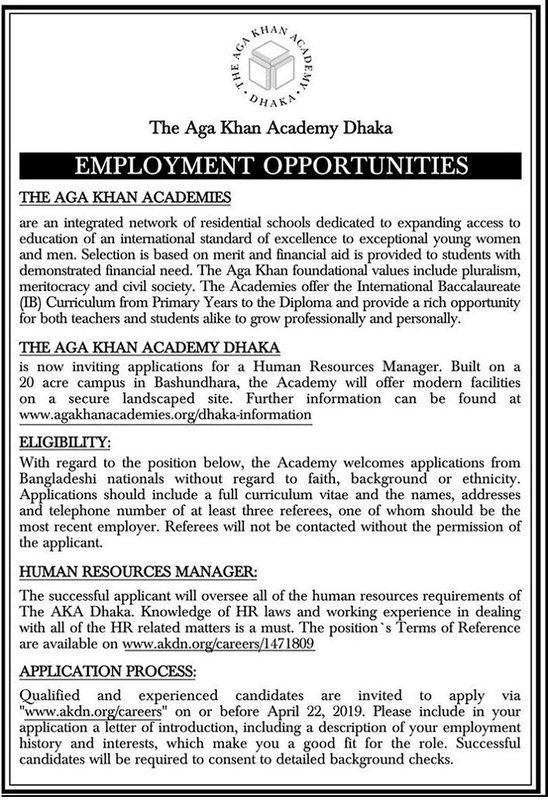 The Aga Khan Academy Dhaka Job Circular 2019 has been published in daily newspaper. We collect the job circular all of info and include our website in job category for the peoples. For the user understanding, we would like to inform you that, the Aga Khan School, Dhaka, is an English Medium School, in Uttara, Dhaka under the Aga Khan Development Network and the Aga Khan Education Service, Bangladesh. It is one of the earliest private English Medium schools in Bangladesh founded in 1988. Good news is, recently the Aga Khan Academy looking for various positions new job holder for their organization empty vacancy. However, if you are interested school college job in Bangladesh, this job is good one. Now, you can see this job details by given BD Jobs Careers then if you think you are right candidate for this job after that to submit your application by maintain their procedure. This entry was posted in All Jobs, BD Jobs, Dhaka Jobs, Graduate Jobs, Jobs Notice, Newspaper Jobs, Private Job, The Daily Star, Today Job by admin. Bookmark the permalink.